The July meeting was well attended with 21 members present. 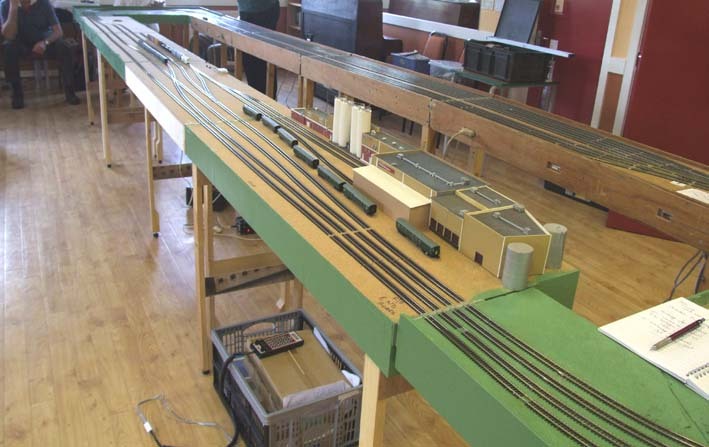 Guys Cuttings was put up for DC operation, and the new DCC group layout 'Watts Crossing' got it's first outing. After an initial hiccup due to one misplaced wire, all seemed to work fine. Signals need to be installed at the crossing, points need to be motored and power cut-off to prevent spads needs to be programmed, and then work can commence on scenery. Work continued on with the fiddle yard for Heworth Sidings, and hopefully it will soon be ready for it's first full test! A small demo was also setup to outline the requirements for proposed 'Freemo' modules. The meeting closed at 3.30pm, and the next full group meeting is on August 18th.